Although neither of us were raised in agriculture, our travels and interests have led us to be committed to food production that is sensitive to the environment, and especially to animals raised for consumption. provide the superb fertilizer for our organic pastures. We raise Cornish-Rock cross chickens, a conventional breed, but we raise them on organic pasture supplemented with non-GMO feed. We process the chickens ourselves using small-scale equipment and animal welfare techniques. Our laying hens of various breeds give us a variety of colored eggs. Like our meat chickens, these girls are raised on pasture, free to scratch for bugs and grass, protected from predators by electric net fencing. We continue to raise Duroc pigs, adding to their diet windfall fruit, garden refuse, and finishing them on acorns like the Ibérico pigs of Spain. 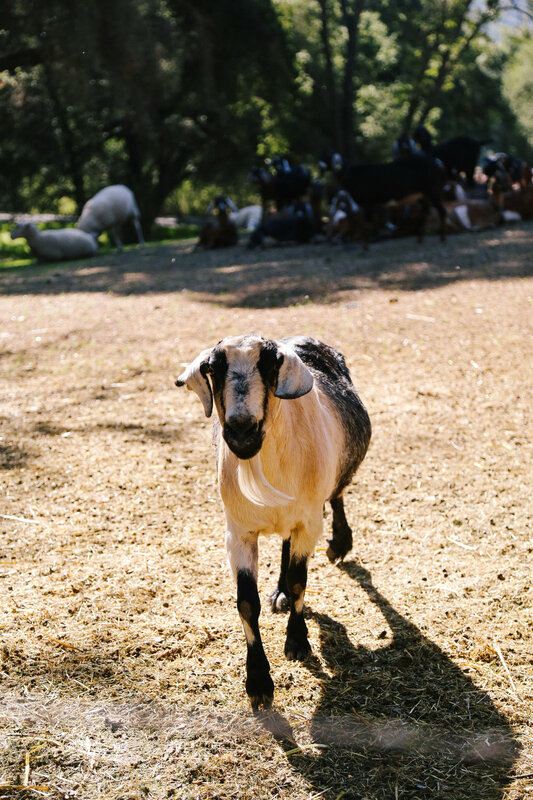 Nubian goats and East Friesian/Laucaune sheep contribute a large amount to our sustainability efforts. The female goats and sheep can be milked; the males cannot, so they are raised for meat. In the winter and spring they have the grass of our pastures. For the rest of the year they are fed foraged hay grown on the ranch across the road without chemical fertilizers or pesticides.